I think we all know that college is expensive. But whats worse is that its getting more expensive at a pretty fast rate. The BLS tracks the cost of college as one of the components of the consumer price index (CPI). So we can easily go the BLS and see what their data says about the rate of inflation of college over the years. I pulled their data from 1978 to 2008 showing the price index of college tuition and then figured the annual % increase per year. Charts for both of these are shown below. First the index of college cost. 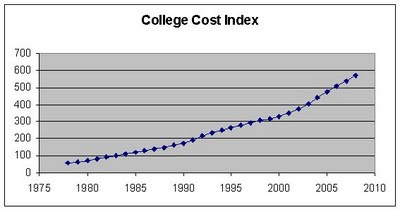 You can see that the costs for college have been rising over the past couple decades. The rate has been going up pretty steady and has not dropped in any single year. 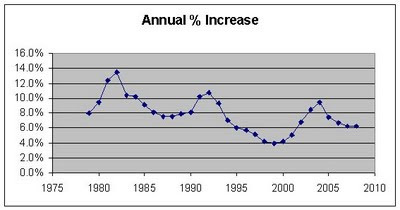 The % increase ranged from a low of 4.0% to a high of 13.4%. The average annual increase in college costs was 7.8% in the 30 year period. 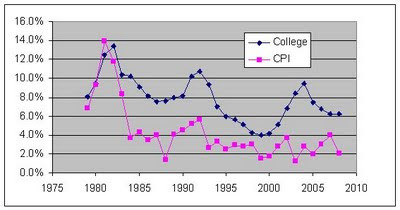 As you can see the Consumer Price Index increased at a much lower rate then inflation in college costs. The CPI as a whole grew at an annual rate of 4.1% in that same 30 year time. The cost of college has increased at a rate 3.7% higher than the rate of inflation.